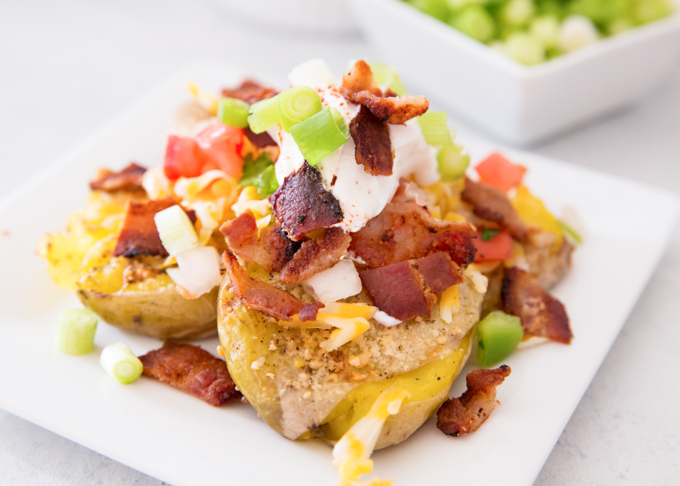 If you’ve never made Loaded Smashed Potatoes, you’re missing out! 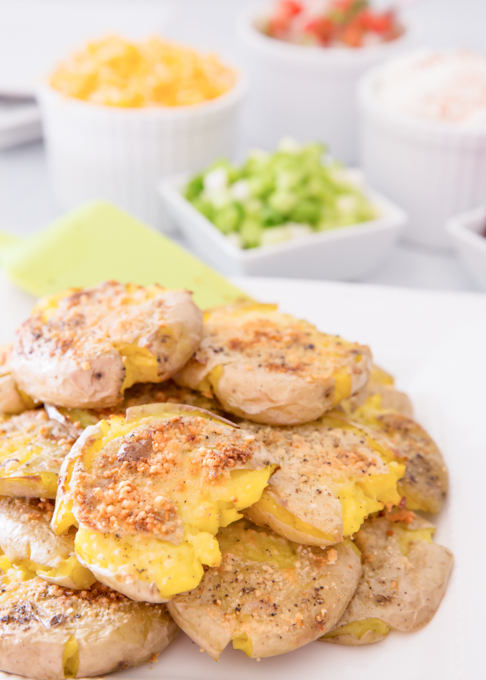 They’re a side dish that your entire family will love!! 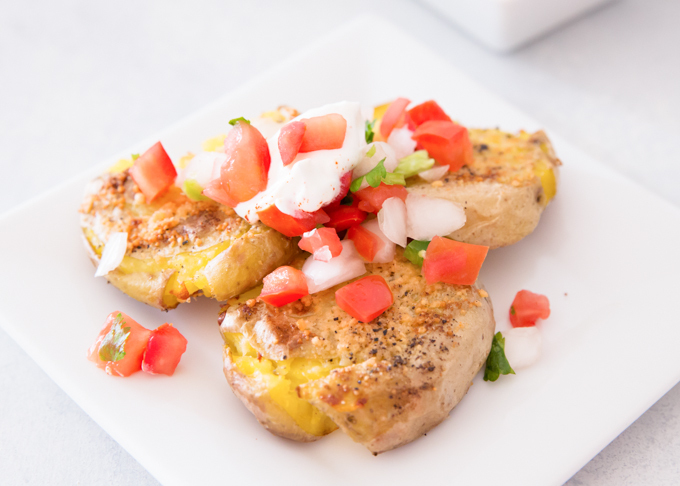 Not only are these simple to make, but the addition of cheese, bacon, salsa, and sour cream make these Smashed Potatoes the best Loaded Smashed Potatoes!! I made them for just the two of us (and had the leftovers with a soft fried egg the following day), but easy enough to make for a crowd! And the best part, is that everyone can top theirs exactly how they want it!!! Start by boiling some small yukon potatoes until tender. 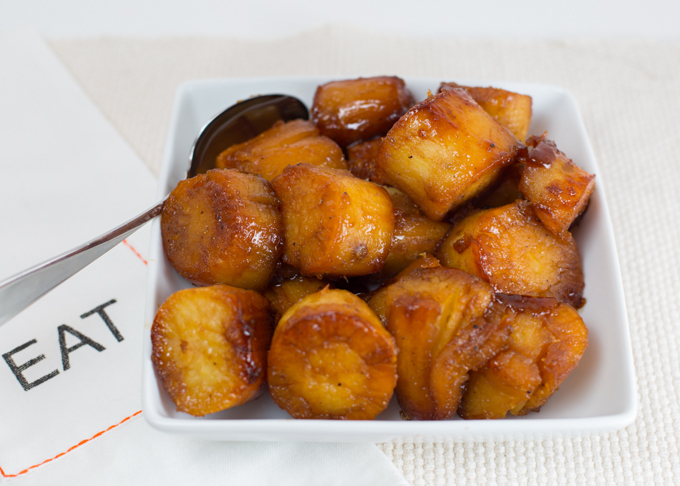 Let them cool just slightly and place on a parchment lined baking sheet and gently smash the potato until flat (I used the base of a drinking glass). 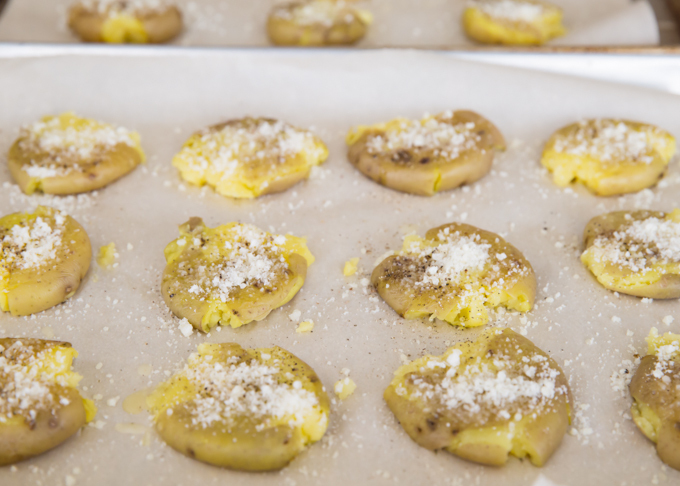 Brush with some melted butter, add some parmesan, and a little pepper, and bake until golden and the edges are crispy. They look delicious enough to eat with no toppings…………..but why would you want to do that?? When instead, you can have a little grated cheese to top yours. I bet the little ones would love these! Or how about with just a little salsa and sour cream? Or if you’re anything like us, you’ll want to pile on the toppings! The works! Give us all the cheese and salsa, and bacon, and a few extra onions, and of course some sour cream! 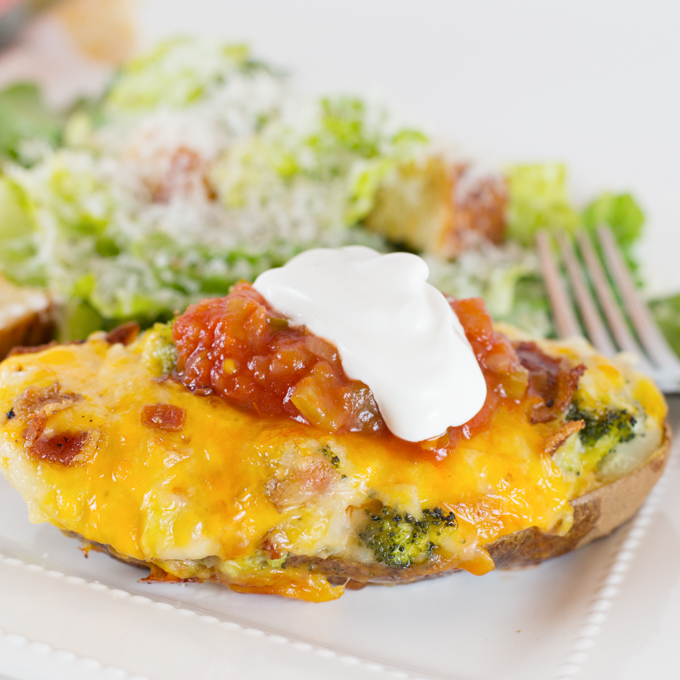 Now this is a Loaded Smashed Potato! Boil potatoes until fork tender. Drain. Let cool slightly and place potatoes onto a parchment lined baking sheet. Smash potato flat (I used the bottom of a drinking glass) and brush with melted butter. Top with parmesan cheese and a little pepper. Bake at 425* until potatoes are hot, the cheese has melted, and the edges are beginning to crisp. For a crispier potato, you can always put the under the broiler for a few minutes, watching them closely so they don't burn. Prep toppings while potatoes are cooking. 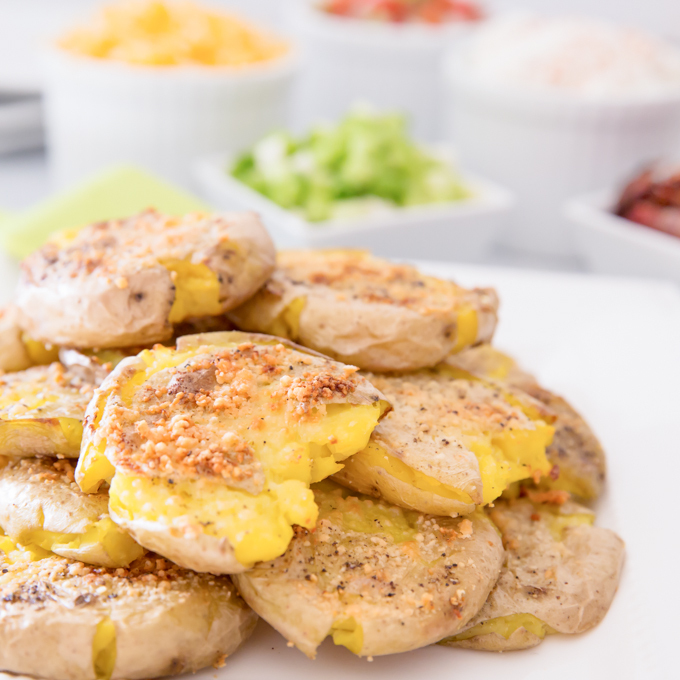 Plate potatoes and set out toppings! 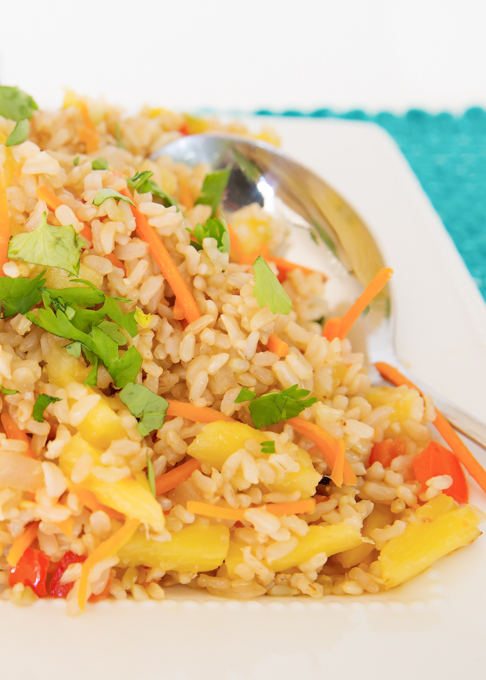 You might also want to try these delicious sides…. 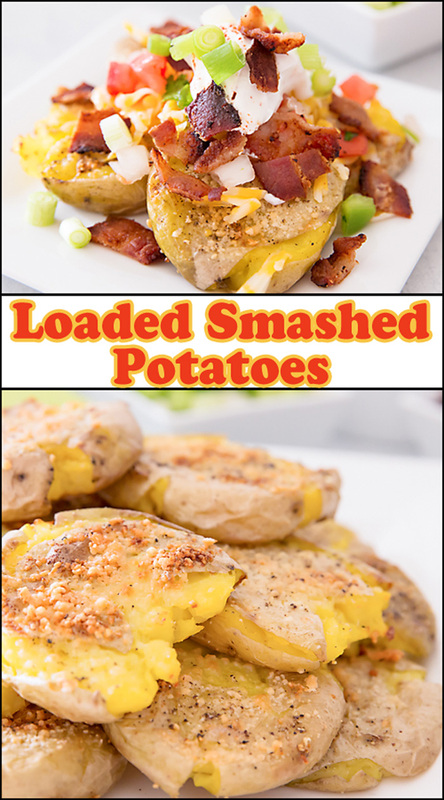 I absolutely love that you smashed the potato and then loaded it up–These will be such a hit a my house Renee!! Potatoes are my family’s comfort food. Love your recipe and pics. Oh man I definitely going to have to try this!! These look so beautiful Renee! 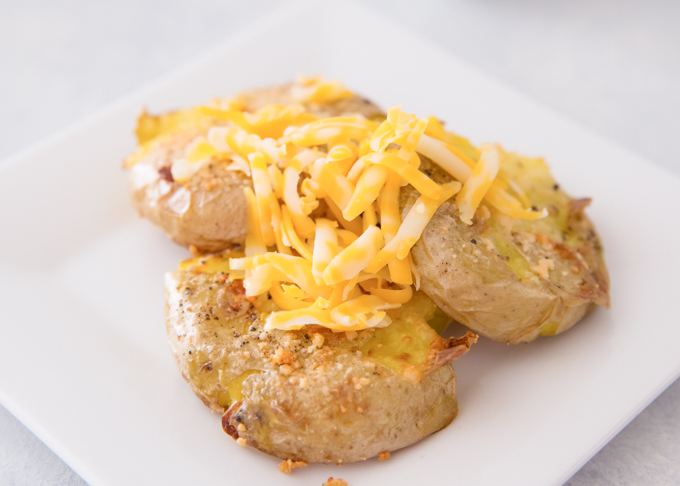 Nothing better than a loaded potato!